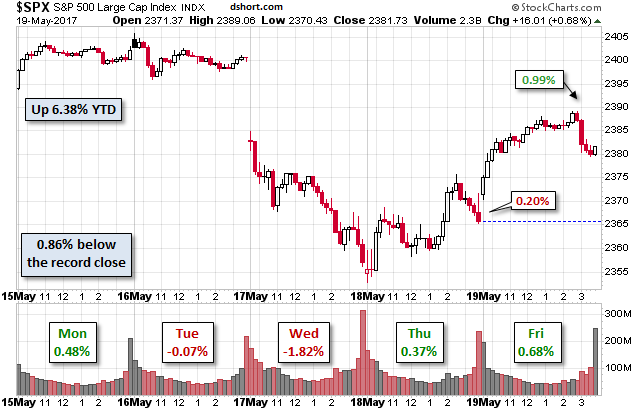 Stocks edged lower last week, with the S&P 500 falling by 0.38 percent to 2,381.73. That was the second weekly decline in a row for the benchmark index but the relatively small loss still left the S&P 500 up a healthy 6.38 percent year-to-date. 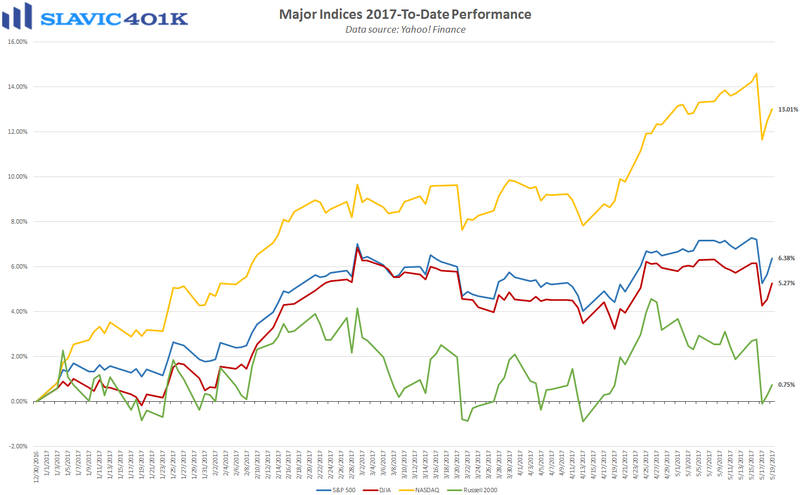 Last week started out on a positive note for equities, as the S&P 500 climbed 0.48 percent on Monday and closed at a new all-time high. However, stocks sold off sharply on Wednesday and most major indices posted their largest 1-day decline in eight months. 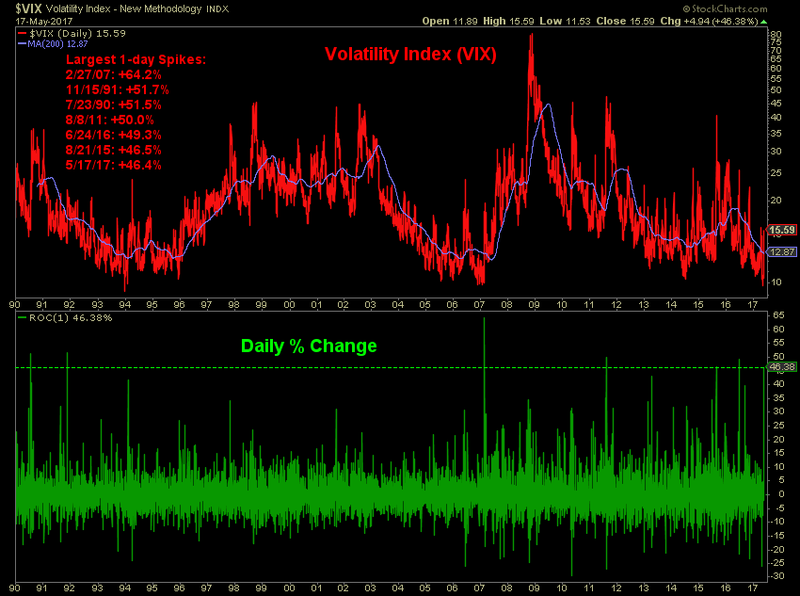 At the same time, the CBOE’s VIX volatility index, often referred to as “investors’ fear gauge,” surged by 46.4 percent. 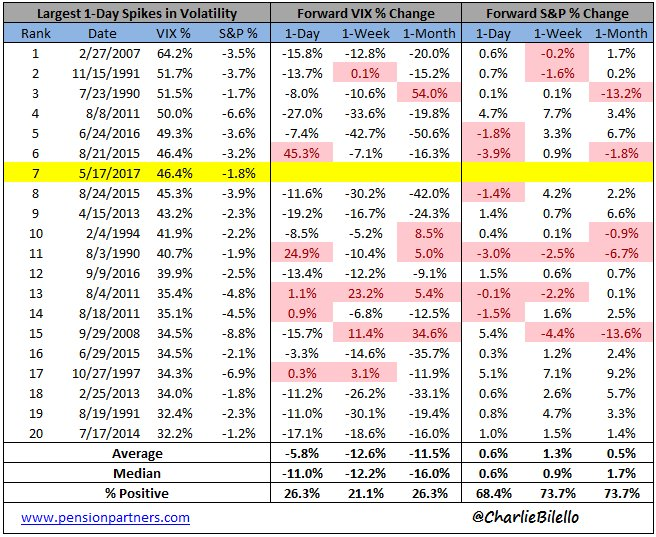 That was the 7th-largest daily increase for the VIX index in history but not necessarily a reason for investors to panic. 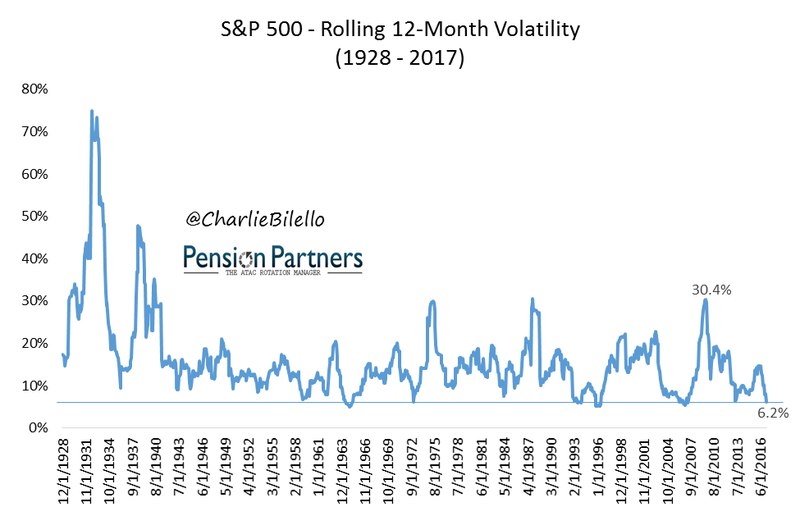 Indeed, stock market volatility has been unusually low in 2017, and many traders were eagerly looking for excuses to take profits (sell) as equities hovered near record highs. Further, a simple backtest of similar moves in the VIX index reveals that the S&P 500 on average actually rises during the 1-day, 1-week, and 1-month periods immediately following significant volatility spikes. This was somewhat seen on Thursday and Friday, as back-to-back gains helped erase a large chunk of Wednesday’s big selloff. 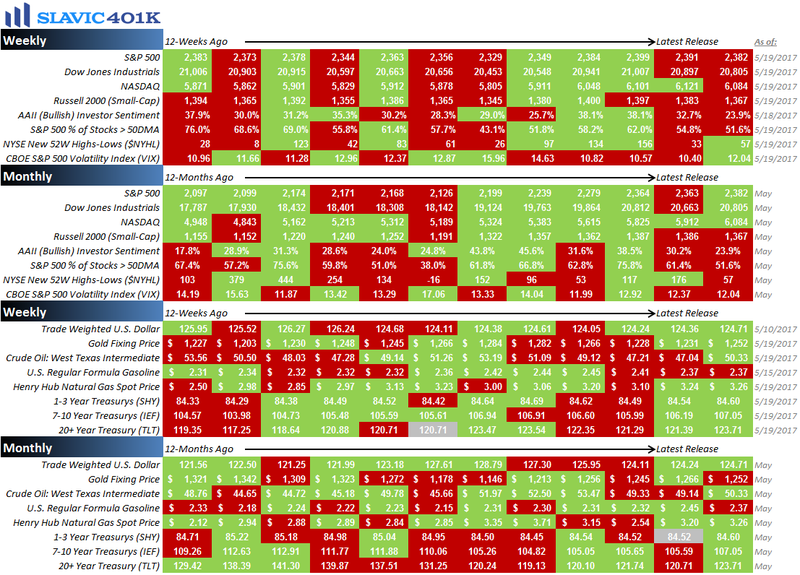 The future, though, remains uncertain, and equities could still rollover and take out last week’s lows. More importantly, novice investors must learn that selloffs are far from uncommon in the stock market. 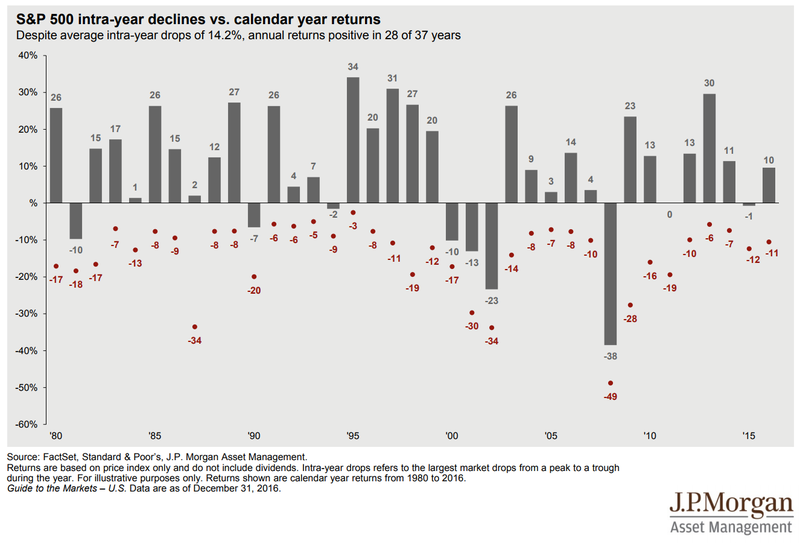 In fact, the S&P 500 since 1980 has experienced an average intra-year drawdown of 14.2 percent but still posted a positive annual return for 28 of the past 37 years. Moreover, retirement investors should focus less on the near-term fluctuations in stock valuations, and more on the long-term goal of amassing wealth. Help with this endeavor is available through the consistent use of tax-advantaged savings vehicles, dollar-cost averaging, and regularly consulting with a professional financial advisor. As always, we are here to help with any questions you may have. 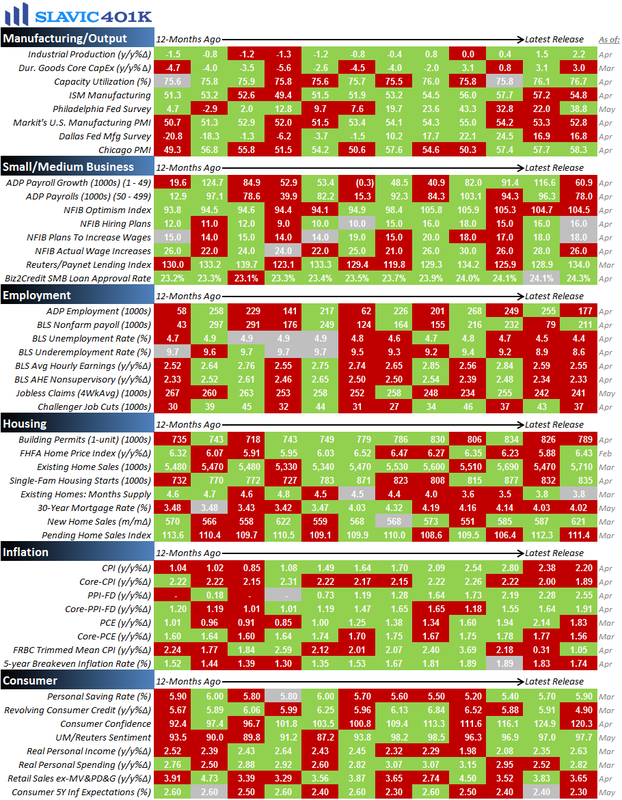 To recap a few of the things we learned about the economy last week, the positives included that homebuilder sentiment improved, industrial production jumped, factory output rose, capacity utilization rebounded, manufacturing activity in the Mid-Atlantic region of the country accelerated, e-commerce retail sales increased, and the number of Americans making first-time claims for unemployment benefits held near a record low. As for the negatives, mortgage and refinance applications fell, housing starts declined, building authorizations decreased, and manufacturing activity in the Northeast region of the country contracted. This week the pace of economic data picks up slightly, with several important reports on housing, manufacturing, and employment scheduled to be released, including the first revision to the government’s estimate of U.S. gross domestic product (GDP) growth during the first quarter of 2017. There will also be lots of speeches by Federal Reserve officials this week, along with the potentially market-moving release of the minutes from the latest Federal Open Market Committee (FOMC) meeting on Wednesday.